Tell me a bit about you and what you are trying to achieve with your writing. I started out as mobile beauty therapist and did that successfully for a long time but then unfortunately I was diagnosed with MS. My business built over many years, so it was extremely soul destroying to have it snatched away from me just like that. Then 3 years ago, I joined a meditation group and through that, I literally fell into writing. At school my education had been poor so unlike most writers I’d had no interest in writing at all, not even as a child. I used to read very little and even now I’m still not a great reader. When I write it’s just what I feel. It comes from my heart. I know everyone says ‘you should read and learn from other writers’ but for me it’s about communicating what’s inside me. My first book was a prayer book, which was a surprise even to me as I wasn’t especially religious. The words would be like a song in my head that wouldn’t go away. I didn’t have a clue what they meant so I just wrote them down. Then another one and another would come. It was only looking back at them all, I realised they were words of prayer. I now say everything is divinely guided when I write. The prayers gave me comfort, even when they weren’t relevant to me, so I decided to put them all into a book to share them and give comfort to others. I thought that was that but then a new title started to form in my head. It started with the word ‘Prisoner’ which seemed odd but eventually I realised it meant a ‘Prisoner Within’ your mind. This then became my first fiction book, which became a play (and now is hopefully moving on to a short film) and my writing just continued from there. How do you manage your work around your condition and the rhythm of life? I take it one day at a time. One of the main problems with MS is the fatigue and I still get really tired. But. Because of the way I write, which just happens when it happens, I have no rhythm or structure to follow. I’m not a writer who sticks to a rigid plan of word count or hours worked. If I did I’d feel that I’d be forcing it and because I am an intuitive writer, for me it has to flow naturally. Going back to your first book, once you had created that collection how did you find out what to do next? I knew nothing about publishing or how to go about creating a book at that point, so I researched it online. Whilst exploring traditional publishing, I discovered self-publishing (I didn’t even know it existed until then.) Self-publishing appealed to me more. What drew you to that route? You have a lot more control. There’s no one else to answer to. You do it how you want to do it. Also, if you want to publish sooner rather than later you can, rather than possibly wait years down the line. I felt I needed to get the book out into the world. It had its challenges as I am a technophobe, but with help from my daughter on formatting etc I was able to send it off to the publishers to create my book. It was a physical book I wanted, not an e-book and decided Print-on-demand (POD) would work best for me. I didn’t want to risk a print run, with stock left unsold. At this stage in my writing, POD is my preferred method. Would you ever consider a traditional route? Yes, I’m not saying never. If was approached by a traditional publisher, of course I’d consider it. I’d be mad not to. For now though, I’m quite happy with the self-publishing route. What about the marketing side of things? Being a technophobe, how do you reach people then? That was a challenge for me. Marketing is not an area of my expertise. When I had my therapy business, most of my customers came by word of mouth so I didn’t really need to worry about marketing. It’s a whole new thing for me. I am working on it, and have just got myself a mentor to guide me down the right path. I want to get my books out there. I know I need to get out there and promote them too, but I don’t like talking about myself. For example, I have my children’s books, including the new dyslexia friendly version and want to approach schools with them. Somethings take longer than you anticipate. That’s OK. I need to work on myself to develop those skills. I know I will get there. Do you resent having to spend time on it rather than the writing? No. Even though I’m not good at marketing, I do enjoy it. I’ve put my writing on hold at the moment. I have lots of books written. I just feel I need to market them properly before I write anything else. My next children’s book is ready to send to the illustrator, but I feel I need to get this skill nailed first. Before now I’ve not needed to be so business focused. Hopefully with my business mentor I can learn how to reach my audience. Other than your mentor, what kinds of support have you used? In the last year, my network of writers has expanded but if anything, I’m offering support to them rather than the other way round. I’ve not done any courses or joined a group at this point. As with my writing, I tend to use my instinct and if I need support I trust the right opportunity will present itself. What’s the question other writers ask you most often? You don’t seem to suffer with the self-doubt which many writers experience? No. I don’t doubt my writing. It may not be everyone’s cup of tea, but this is a subjective business so if someone doesn’t like my work that’s fine. Everything I write is positive and comes from my heart and I’m happy to trust myself. If I can help just one person with my books that’s fantastic. I believe everything before, my beauty therapy, my MS, have led me to where I am now and helping others through my writing is my purpose. What’s challenging you now which perhaps is new compared to when you first started writing? As I said, at the beginning it was the technical side of publishing which presented a challenge. I’ve learnt all sorts of new things along the way and you never stop learning. Now, I would say that I’m my biggest challenge. I know I don’t push myself enough or as hard as I should. I need to develop confidence in myself, develop my presentation and public speaking skills. I happily present a local radio show but presenting face to face is a whole different ball game. How did you end up presenting on the radio? I originally went along to be interviewed about my books and I’ve been there ever since! The programme is called the ‘Out and About’ show and covers what’s on in the local area; bands in pubs, theatre, galleries, museums. We have loads of fun. Lots of guests who are on the show, come back. What do you wish you’d known when you started out as a writer that you know now? Realising I needed to find my audience and ways to get my books out to those people. That was hardest as a new writer, with no knowledge of how to tackle that part. Do all writers need a social media presence? No. I think it’s up to the individual. It does help for marketing purposes and to reach new readers but if you can get by without it and find other ways to sell your books then you shouldn’t feel forced to use it. I have found it has really helped me through my author page and online groups I belong to etc, but that’s my personal preference. What’s the best thing that could happen in your writing career? This year Prisoner Within was longlisted for global award which was a huge achievement. I’d love to be best selling author but really my own success is a bonus; the best thing that can happen is for my books to help others. 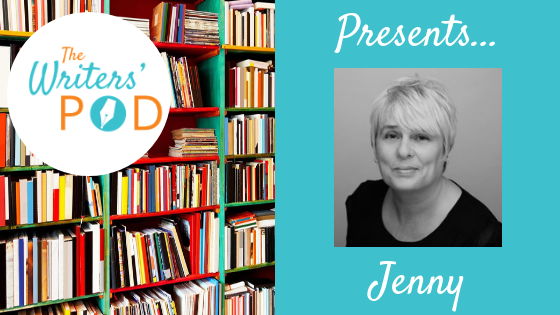 For more information on Jenny and her books, please follow the links below. Watch out for the next Writers’ Pod interview with Becky Alexander, food editor and co-author of Packed. Sign up to receive the November newsletter which contains some exciting news about new services launching in 2019 and offers in time for Christmas.